The Great Wall is not, in fact, a single entity. Different emperors and dynasties over 2,500 years built sections of defensive wall in several different locations. In Chinese it is called 万里长城 [wan li chang cheng], meaning the 10,000 li long wall (li is a unit of length, the modern standard being 500m, about 550 yards – so 10,000 li is about 5,000km, or 3,100 mi). 10,000 is a number that represents forever – but in this case it comes up short! Archelogical surveys estimate there are over 21,000km (13,000 mi) of wall segments in total, covering a swath of land over 2,500km (1,550 mi) long east-west, and ranging about 2,000km (1,200 mi) north-south. The earliest sections of the wall, built 400 BC-200AD, are several hundred kilometres north of Beijing and extend into North Korea in the east and Mongolia – and Xinjiang (新疆) province – in the west. From 700-1200AD there was no wall-building activity. The Jin dynasty built walls around 1300AD, much further north in Mongolia – both in Inner Mongolia (内蒙古 nei meng gu) province in China and in the neighbouring country of Mongolia, along the modern border with Russia. The Ming dynasty wall is what most people mean when talking about the Great Wall of China. The Ming dynasty wall was the last building phase, around 1400-1600 AD; it is over 6,000km (3,700 mi) long, plus another 2,000km (1,200 mi) of other defensive measures (trenches, and natural barriers like mountains etc.) It was much stronger than previous wall building efforts, as it used stone, bricks and mortar. A lot of resources were devoted to repairs and reinforcements during this time, and a network of 1,200 watchtowers were built. The main Great Wall tourist spots near Beijing are all part of the Ming wall. From Beijing – and surrounding Hebei (河北) province – the Ming wall continues East; a small branch extends to the ocean, while the main wall continues up through Liaoning (辽宁) province to the border with North Korea. In the other direction it extends southwest, loosely following the northern borders of Shanxi (山西), Shaanxi (陕西) and Ningxia (宁夏) provinces, then turns northwest up through Gansu (甘肃) province. Of course, only small portions have been reconstructed. Most of the Great Wall, including the Ming wall, is in ruins. 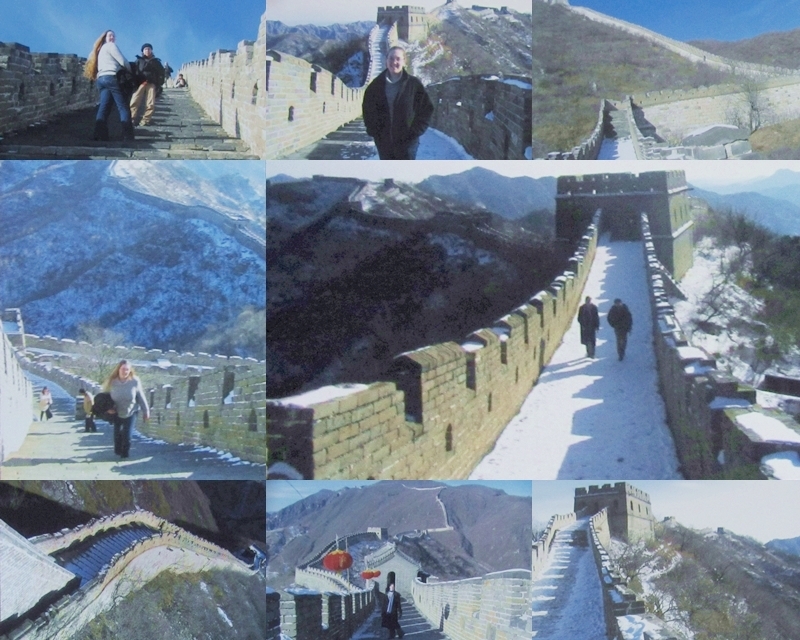 In 2013 I visited the Great Wall for (if I count correctly) the 14th and 15th times. I’ve been to 5 different parts of the Wall. I’ve been in sun, cloud, rain, and snow. I’ve been in all four seasons. I thought it would be fun to share some of these experiences with you; every visit was utterly unique. ALL my trips together would make for a marathon post, so I’ve divided them into two groups. 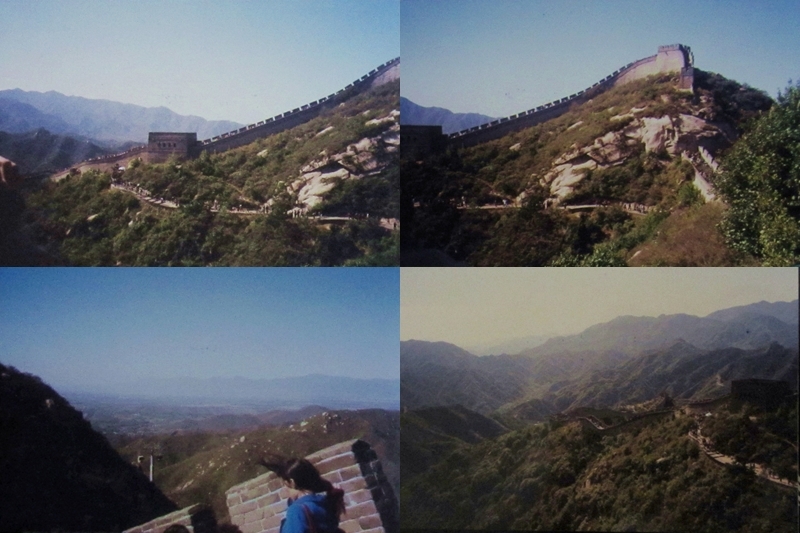 This post goes to the end of 2004; this was my first year in China and I went so many times that one year that it makes a good half-way point. (Click the images below to see slightly larger versions). The earliest Great Wall photos I have are not from my first visit to the Great Wall, but my parents’. They visited China in 1983, when I was 9 months old (I stayed home tormenting my grandparents by wanting to play outside during a heatwave right after they’d installed air conditioning for the first time). Back in 1983 the reconstructed section was much shorter – in the photo below you can see my Dad standing on an unfinished section. The expressways didn’t exist, either, so it was quite a trip outside the city. Although back then even the Summer Palace was a fair trip from the city. I am fascinated by these and other photos my parents took – layering them in my head over the city as I know it now, marvelling that my parents and I have stood on the same spots, decades apart. 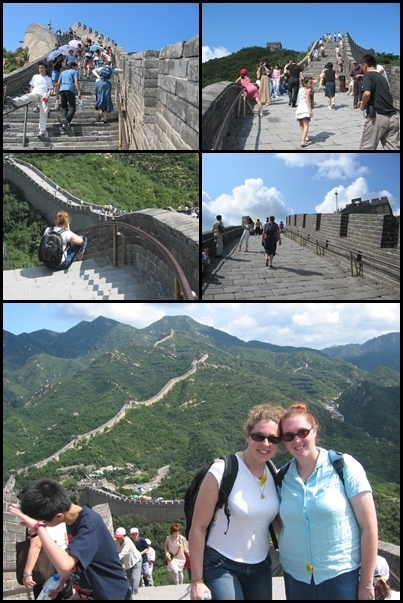 My first trip was also to Badaling, on my first visit to China while still in grade 12 in Australia. I had sprained my ankle the night before, so our group took the cable cars up and while most of the group hiked down, my teacher stayed with me as I hobbled a little, then found a perch to sit and sketch. It was October holiday, so the wall was even more packed than normal. My teacher took photos of the commotion I caused – the whole section was blocked by Chinese tourists checking out the strange foreign girl drawing the scenery. I was embarrassed by it back then but now I wish I had those photos! (Similar crowd-stopping photos were taken at other tourist spots, the Lama Temple in particular). My first year in Beijing I studied full time, and went through an agency to help organise some of the details (especially accommodation, since I didn’t want to live on campus). A month after I arrived they arranged a trip to the Great Wall that was free for most students, so I went along, seeing Mutianyu for the first time. It was a landscape without colour – all grey and brown. Even the sky was grey – but toward the end of the day it started to snow lightly, which was certainly a highlight for me! My family visited me during my summer break, and I took my sisters to Mutianyu. It looked so different! Many shades of green, on a sunny blue-sky day. We took the toboggan down the mountain, which was a lot of fun. My parents went on their own at the end of the trip. The day they went was rainy, and the mist drifting across the hills provided a very different view. Not long after they left, my best friend came over for a visit. We took the Chinese tourist bus to Badaling. You wait at a stop by the road, pay a small fee (I think it was only 50 RMB each) and become part of an instant tour group. Everyone got a pin with their group number, and the Chinese tour guide talked into the loudspeaker on the bus the whole way. I think she was pretty concerned that she would lose the two foreigners – or, more importantly, that we would fail to understand/heed directions and thereby hold up the whole trip. The full day trip included the Great Wall and the Ming Tombs (the only time I’ve been, actually). I went back to Badaling on a school trip – free for BLCU students. I spent the day with some Indonesian friends from class. It was a Saturday and so the wall was pretty packed with Chinese tourists. My friends took photos of a group of tourists in minzu (ethnic minority) outfits, including asking to pose with them for photos. Half an hour later, while we sat and rested, some Chinese men asked to take photos with me (the token white girl). My friends were quite indignant about them doing that, asking that of me – which I found ironic, since they’d done the exact same thing earlier… Unfortunately, I’m missing photos from that semester, so I don’t have photos from this trip, or the next one. One of my friends organised a camping trip and it turned into a huge deal! 50 of us travelled out of the city in the evening and camped overnight at Jinshanling, un-reconstructed section of the wall. We carried up sleeping bags and just lay down on the surface of the wall to sleep. It was a great experience! Another friend from Australia visited during my last two weeks of school, helping me pack up and travelling back to Canberra with me. We went to Mutianyu with a friend-of-a-friend from Russia who was also visiting. It had snowed a week earlier and there was still snow around. The sky was clear and blue – it was a beautiful day for visiting the wall! That memorable trip happened during the last week of the study year I came to Beijing for. 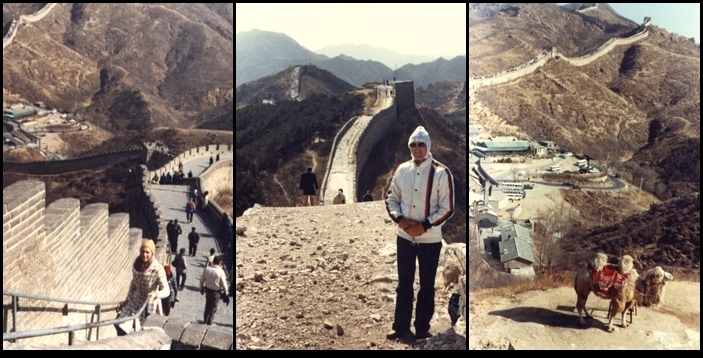 Of course, I returned after a few months in Australia and nearly 9 years later I’m still here – and I’ve been to the Great Wall many times since. More photos and stories coming in part 2! Your pictures are amazing. 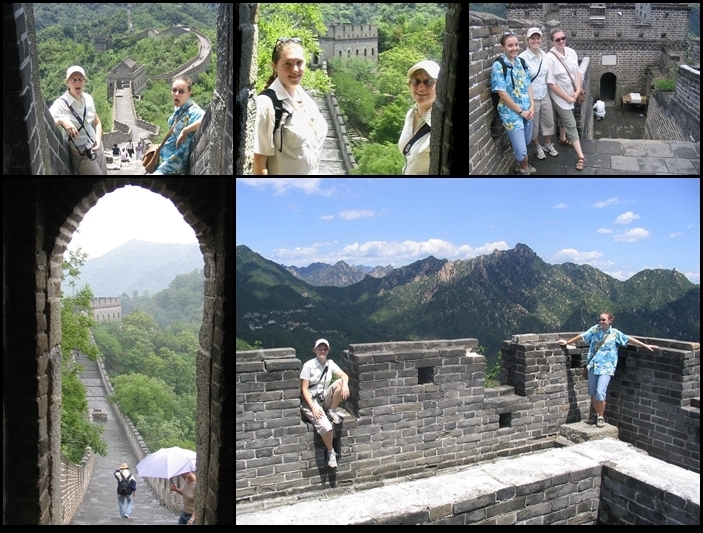 Just looking at those pictures make me want to climb the Great Wall of China now. I also have a blog with Jinshanling travel tips, I’d love to share it here with you and for future travelers.